If your looking for a quick lunch idea or you need an uncomplicated side dish to serve alongside your grilled chicken breasts tonight, give this recipe a try. 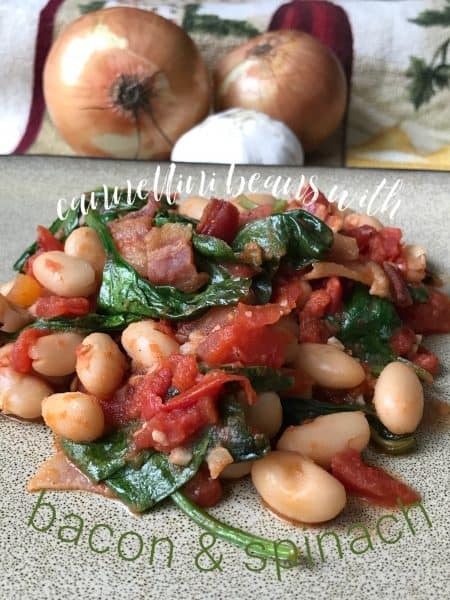 Cannellini beans with bacon and spinach is so good you might just forget about the chicken breasts altogether. 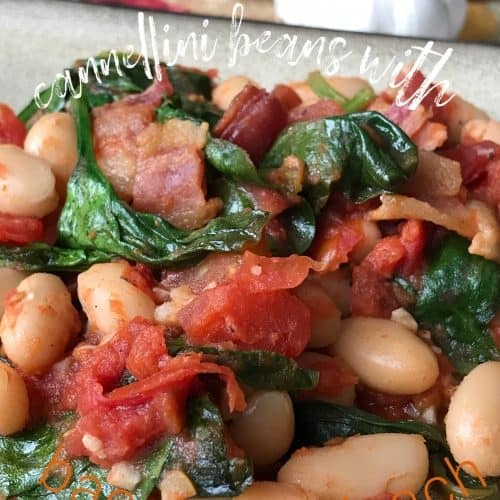 This dish gets its salty and smokey flavor from the bacon and the cannellini beans add meatiness to the dish. Cannellini bean [kan-eh-LEE-nee] is a white Italian kidney bean, which is available both in dry and canned forms. Cannellini beans are particularly popular in salads and soups. They have become increasingly popular over the years due to their meaty taste, which adds richness to any dish/soup they are added too. My kids who aren’t fans of red kidney beans, (they’ll pick them out of chili) will eat white kidney beans. Go figure! 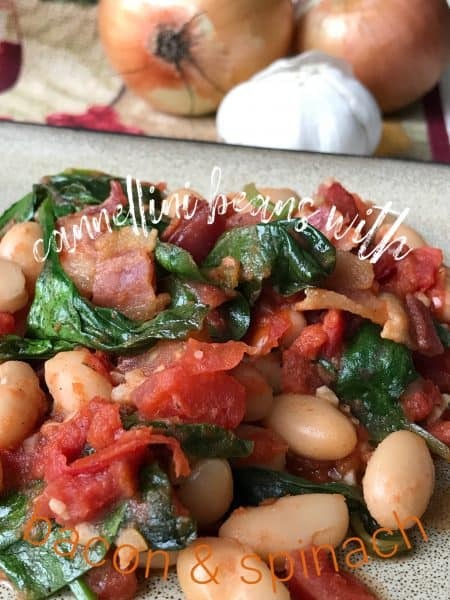 After discovering cannellini beans a few years back, we too have added cannellini beans too many of our recipes here on Turnips 2 Tangerines. 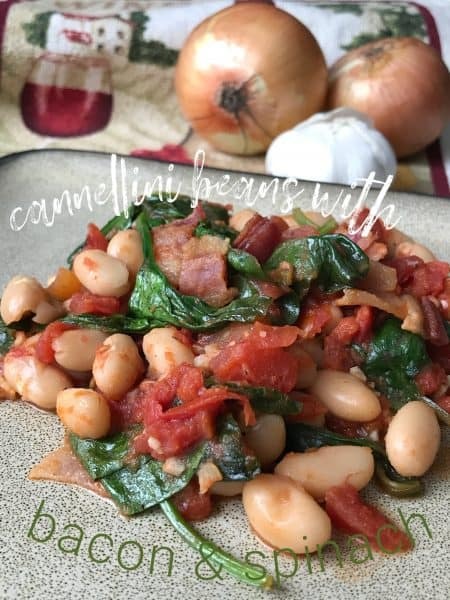 Cannellini beans add a subtle flavor to dishes. They’re hearty enough to stand up to long hours of cooking like their cousin, the red or dark red kidney bean. 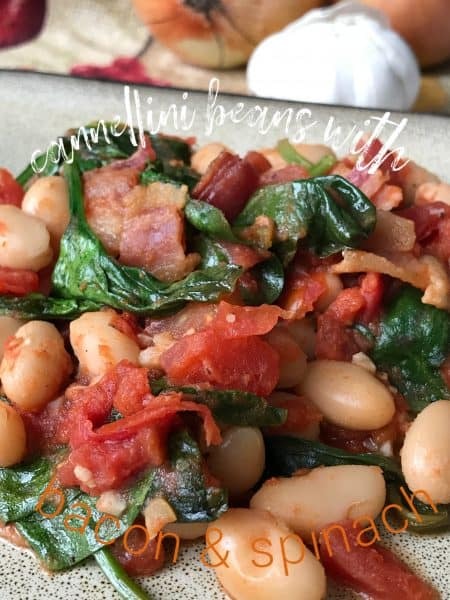 Many people who don’t like kidney beans will like cannellini beans because the flavor is really rather mild. Give cannellini beans a chance, you might be pleasantly surprised. Dried beans are rich in protein, calcium, phosphorus and iron. Their high protein content, along with the fact that they’re easily grown and stored, make them a staple throughout many parts of the world where animal protein is scarce or expensive. Dried beans are available prepackaged or in bulk. Most dried beans will need to be soaked in water for several hours or overnight to re-hydrate before cooking. Here is a short list of our ‘cannellini bean’ favorites: Tuscan Beans, White Bean Spinach Soup and Italian Wedding Soup. A fast and delicious meal option or side dish. In a large skillet over medium heat, fry the bacon until crisp. With a slotted spoon, remove bacon and place on a paper towel lined plate to drain. Drain bacon fat from skillet leaving 2 tablespoons in pan. Add the oil and let it get hot. Add the garlic and cook for 1 minute. Add the beans and tomatoes. Cook for 5 minutes over medium heat. Add the spinach, salt, pepper and bacon. Cook until the spinach wilts, about 5 minutes. Serve immediately with fresh Parmesan cheese shavings. For this recipe we used beans from Bush’s Beans.